Stanley Fischer, who led the Bank of Israel for eight years until he stepped down in June, has been asked to be the Federal Reserve’s next vice chair once Janet Yellen takes over as chief of the U.S. central bank, a source familiar with the issue said on Wednesday. Fischer, 70, is widely respected as one of the world’s top monetary economists. At the Massachusetts Institute of Technology, he once taught current Fed Chairman Ben Bernanke and Mario Draghi, the European Central Bank president. Yellen, the current Fed vice chair, is expected to win approval from the U.S. Senate next week to take the reins from Bernanke, whose term ends in January. Fischer, as an American-Israeli, was widely credited with guiding Israel through the global economic crisis with minimal damage. For the Fed, he would offer the fresh perspective of a Fed outsider yet offer some continuity as well. 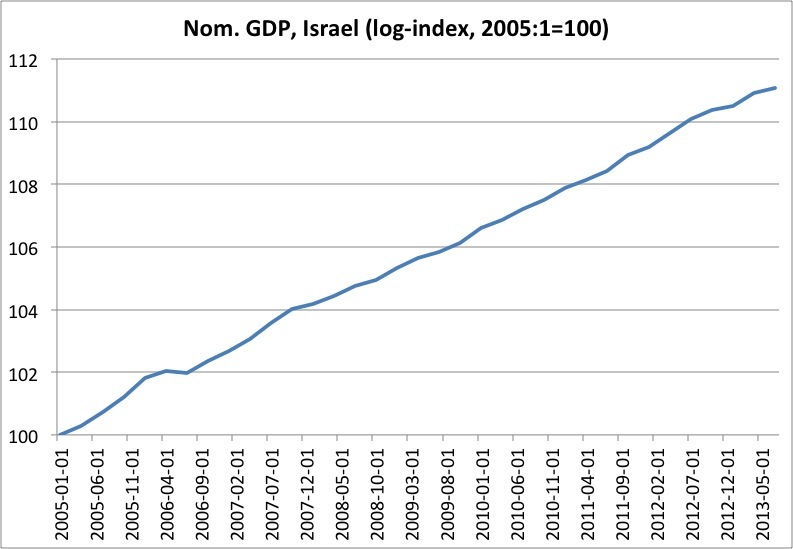 While at the Bank of Israel Fischer certainly conducted monetary policy as if he was targeting the level of nominal GDP. Just take a look at the graph below and note the “missing” crisis in 2008. Undoubtedly Fischer had some luck, while at the BoI, and I must also say that I think he from time to time had a problem with his “forward guidance”, but his track-record speaks for itself – while Bank of Israel governor, Stanley Fischer provided unprecedented nominal stability, something very rare in Israeli economic history. Lets hope he will help do that at the Fed as well. Don’t feel bad – until recently I kept trying to spell Richard Fisher’s name with a “c” (as Stanley’s) and I’m in the U.S.! The eurozone desparately needs a true fiscal union in order for it to be an optimal currency area (OCA), and euro bonds would be an essential step towards this. Furthermore central banks should not be in the business of interfering with fiscal policy. I am a little taken aback that Israel’s top central banker will now be the USA’s No. 2 central banker. Seems unusual.I wonder how the right-wing nuts will react. Fischer seems okay, though still not growth-oriented enough. The USA does not have to worry about inflation; indeed higher rates of inflation would be good. Will Fischer influence the Fed, or will the Fed influence Fischer? Bernanke went into the Fed as an academic who studied Japan and the Great Depression…yet the Fed seems to have made Bernanke inflation-obsessed. The USA now around 1 percent inflation on the PCE deflator. This was an enormous project, something like 200,000 jobs…. Imagine if Spain’s currency had depreciated a lot, and the sentiment was that it was a cheap destination….